Now you are probably thinking to yourself, why do I need the best meat grinder or any meat grinder for that matter? Well to grind your own meats of course. But then you may say “well I can buy ground meat at the store”. Yes, you can but that stuff is not entirely what you may think it is. The ground meat you buy in the store is usually just the scraps and worst parts of the meat so you are not really getting to taste the quality of the meat. In addition, ground meat you buy in a store will sometimes have special additives and preservatives so it can stay on the shelves longer. They will add extra fat and water to bulk the meat up, costing them less in the long run. To learn more about the secrets of ground meat in the supermarket. With all that being said, its time you get the best meat grinder for your kitchen. You will be able to actually try different cuts of meat that you would not ever be able to get ahold of in the store. You can mix and match your ground meat together to find the perfect combination for all your favorite foods like burgers, meatballs or any other dish you may add ground meat to. Or maybe you want to fill some ravioli with fresh ground meat that you have just made fresh pasta from with your pasta maker. A meat grinder can also grind other food besides meat. You will be able to grind your own chickpeas to make really great hummus. You could also grind up vegetables to make a wonderful gazpacho soup. When you grind vegetables the end result will be finer than mincing them and the machine will do all the work for you leaving you with less knife work in the kitchen. In this article, we will cover everything you will need to know about a meat grinder as well as what to look for when purchasing one. We will also cover some of the models that are available for purchase on the market right now and which ones are good choices while others are not. Choosing the best meat grinder can be somewhat difficult if you do not know what to look for. That goes with just about every appliance, but a meat grinder is a little more uncommon to find in a home kitchen like a meat slicer or a deep fat fryer. When buying a meat grinder, you want to get one that is for grinding meat. There are some alternatives out there that may be similar or way off that claim to grind meat just as well. 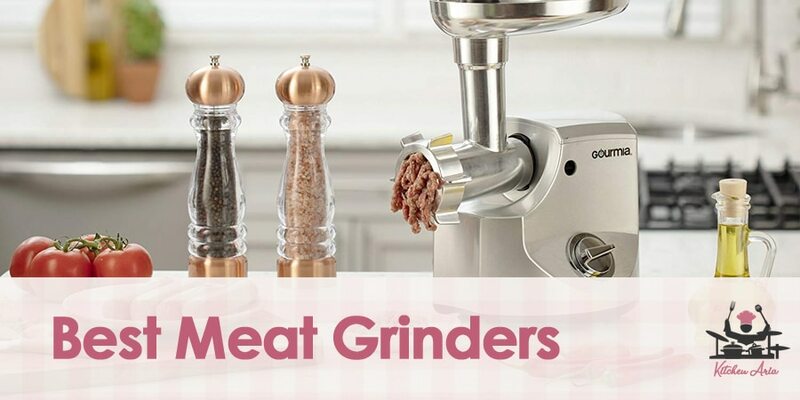 Food processors and other non-meat grinders say that they are able to grind meat. While that may be true, they are not designed to grind meat and won’t be able to handle heavier jobs a meat grinder could do. There are also attachments you can buy for your stand mixer. This may work for a while but they just don’t have the power to get the job done efficiently. If you plan on grinding a lot of meat or just want to have a machine that will do it correctly every time, then buy an actual meat grinder. You want to buy the best meat grinder with very good construction. Meat grinders handle very tough jobs and need to be operated with plenty of force. Having a machine that will not shake or rattle when in use will ensure the grinding process is smooth. You will want to buy a meat grinder that is strong and sturdy. Do not purchase one that may be flimsy or lightweight, you will soon realize why this was a bad choice. Having a strong auger and a sharp cutting tool will also make grinding meat seamless. Sometimes if the inner workings of the grinder are not strong enough or ill-fitting, meat will get clogged in the machine and it will not grind. Also, the fat and sinew will plug of the holes of the receptor which in turn will not grind either. A trick to grinding meat more efficiently is to partially freeze the meat, this helps the grinding process immensely. You could also use a meat tenderizer to break up some of the muscles and ligaments of the meat before grinding. To see how a meat grinder works, click here. Meat grinders can also come with an array of accessories to do other jobs and tasks with your grinder. Some meat grinders will have extra attachments with them like sausage stuffers of different sizes so that you may make homemade sausages after you have ground up your meat. Different size and shape cutting tools will be sometimes included to better handle specific jobs easier. It is best to always have a spare cutting tool on hand so if the machine comes with an extra cutting tool, that is a bonus. Most machines, but not all, come with a pan that can be inserted in the meat receptor tube so will can place extra meat in it while grinding. This will hold the meat until it is ready to be ground up creating a lot less work for you to keep feeding meat into the grinder. A warranty will help to protect your meat grinder when it breaks. Most quality meat grinder manufacturers offer a lifetime warranty with their machines because they are confident it will last forever. If the machine does not come with some sort of guarantee or warranty then it is pretty clear that is a red flag and should not be considered as a reliable product that will outlast the test of time. The first meat grinder is a beautiful machine that is able to grind up to 13 pounds in under a minute while still remaining as quiet as a mouse. The extended auger helps with the process of grinding the meat more efficiently while the pan above can hold all the meat to be loaded. The machine comes with a meat stomper for pushing the meat down the tube while grinding which helps a lot. There are also 3 different sizes of sausage stuffing tubes you can use to make homemade sausage. The body and all inner working parts are made of stainless steel to reduce the number of fingerprints and smudges. To top that, the machine comes with a 5-year warranty to protect it from any major repairs or damages that may occur. Here is another great meat grinder and a great deal that comes with the machine. It comes with plenty of extra sausage stuffing tubes, multiple cutting tools of different shapes and sizes and 4 different grinding plates of different sizes to use on all cuts of meat. The machine is whisper quiet and can grind up to 360 pounds of meat per hour. This does depend on the speed you choose. Which brings us to the next feature, adjustable speed. It can be changed to 3 different speed settings to really make sure you get a good grind. The machine is also covered by a 3-year warranty on all defects and damages. Here is a quality machine with a strong motor to power the auger. Can do up to 200 pounds per hour in this very large meat grinder. This grinder is the largest non-industrial meat grinder available and has a 1.3 HP motor. The machine does come with a sausage stuffer, auger, blade and grinding plate but there is only one of each meaning no backups if needed. This strong machine also has a clean and sleek look, perfect for any kitchen counter top. However, there is no warranty to cover the machine but may be purchased at an additional cost. This meat grinder is pretty basic when it comes to features. But that doesn’t mean it won’t get the job done and at a fair price. The machine is a mid-grade sized machine and is able to grind 3 pounds of meat per minute. It comes with a loading pan, meat stomper and sausage stuffing tube to make your own sausage. It does not have any replacement parts though. This machine will do the job adequately but nothing more than that, but for the price, it’s a pretty good deal. However, there is no warranty covering this meat grinder if damages occur. Another great machine that is very similar to the last one we reviewed but with only a couple extra accessories. Plus, this machine is a little bit cheaper than the other one so it may be a better deal to go with. The machine is pretty basic and will get the job done as well. It comes with two different sausage stuffers. Plus, the meat grinder has a forward and reverse speed to help unclog the machine for smooth operation. While the meat grinder does 3 pounds a minute as well, it uses a double grinding plate to ensure the finest grate possible for the meat to be ground. Yet again, another very basic meat grinder that will get the job done. This one is a little bit more expensive than the other two because it is much larger. The machine can also do 3 pounds of meat per minute but also has a surge protector on the breaker to shut off if there is too much meat in the grinder at once. The machine also comes with sausage stuffers and multiple size grinding plates to be used for different tasks. The machine is pretty sleek looking and a fairly priced as well. However, it is not covered by any warranty, but one may be purchased to cover it for any damages that may occur. This is a very affordable little meat grinder with some great qualities. This machine is smaller than most of the other grinders but still has the strength to grind any type of meat. The machine comes with 2 different sized sausage stuffers for making your own sausages. It also comes with 3 different grinding plates for to interchange. This machine also claims to be able to grind vegetables while other say they can’t. This is a great quality to have in a meat grinder because it makes it a multipurpose tool. While the machine is very inexpensive and looks great on the outside, it is not covered by any sort of warranty. This is also a great little meat grinder for the kitchen. It is very fast and efficient with any task thrown at it. It is a very basic machine but is very inexpensive and popular. It is very sleek looking, so it would be perfect on any kitchen counter. It is so popular that the product tends to sell out from time to time. So, if you are going to get one you better make it fast. The machine comes with all the basic attachments and accessories. But there is no sausage stuffer, different grinding plates or spare parts. On top of that, the machine is not covered by any warranty against any defects or damages that may occur. But for the price and popularity, you got to wonder what makes it so special. And last and definitely least, the hand crank meat grinder. This meat grinder is modeled after the original meat grinder. So, it goes without saying that all the features you get with an electric meat grinder will definitely outweigh what this machine has to offer. The price difference between the two types is not that far, so why wouldn’t you spend a few extra bucks for an electric. Well, the main reason would be that this machine uses your own speed and strength for the grinding. You are in control of how the operation is going. Which is great in that sense but it is not so great for people who are uncoordinated or not strong enough to make it a functional device. However, it is small and compact, uses no electricity and is easy to use and clean. The machine is also made of quality materials and comes with a warranty to protect it from defects or damages. It is the best manual meat grinder available on the market. Whatever meat grinder you decide to go with, first make sure it is an actual meat grinder and not a machine that can grind meat also. Make sure you are comfortable with the meat grinder as well. These are dangerous machines and need to be utilized properly and safely. Knowing your meat grinder and how to use it will make all the difference.